Water is vital for all cell function. It helps your brain to produce hormones and neurotransmitters, your joints to stay lubricated, your skin to keep cool through sweating or respiration, and your body to excrete waste. It is little surprise the Center for Disease Control and Prevention places an emphasis on drinking plenty of fluid as upwards of 75% of Americans suffer from chronic dehydration. The average adult can survive up to three weeks without food but, take water away, and you might only last for 100 hours according to Duke University professor Claude Piantadosi. Dehydration occurs when there is a net outflow of water: that is, you’re losing more fluid than you’re taking in. The loss could result from excessive sweating during hot weather or exercise, a fever, vomiting or diarrhea, or simply not drinking enough of the right fluids. 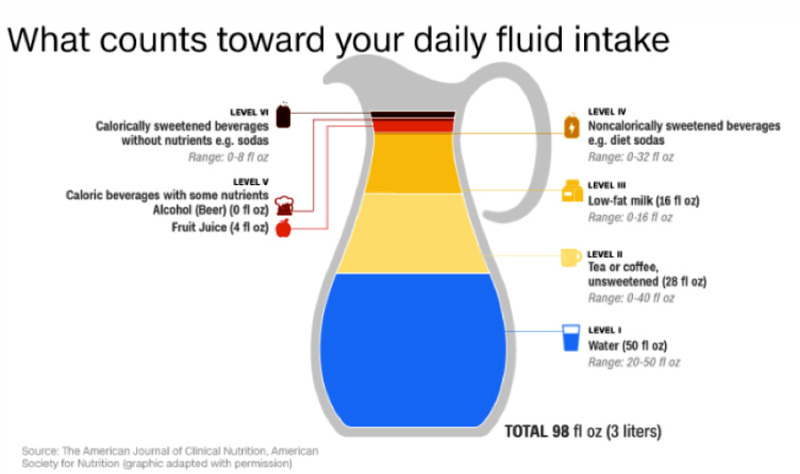 The American Journal of Clinical Nutrition recommends drinking up to 3 liters of fluid a day with the following graphic illustrating precisely which ones count towards your daily intake. Dehydration results in several symptoms; from difficulties with concentration and mild irritability through to acute conditions such as heat exhaustion, even life-threatening heat stroke. Repeated dehydration can impact kidney function, while electrolyte imbalances could trigger a seizure. In the most severe cases, dehydration causes a dramatic drop in blood pressure, which reduces the oxygen entering your body. This is also known as Hypovolemic Shock. Young children, the elderly, and the infirm are at the highest risk, but we can all suffer from a degree of dehydration with categories ranging from mild or moderate to severe. The last reflects a life-threatening emergency that requires immediate medical treatment. Thirst, a dry mouth, dark urine, headache, and muscle cramps can indicate you are already dehydrated. Proper hydration has immeasurable benefits for both your health and your productivity. Water helps you focus. Your brain is roughly 75% water, so drinking enough fluid is critical for you to remain clear-headed, focused, and creative. Water also delivers essential nutrients to the brain and removes toxins from the blood. Hence, when you’re hydrated, you feel alert and able to concentrate. Drinking plenty of fluids improves your complexion. Water flushes toxins and other unwanted substances out of the body meaning that if you are hydrated, there are fewer contaminants in your system. This improves your complexion with those who drink plenty of fluids as part of their regular diet showing the best skin health and the fewest signs of aging. Feeling hydrated makes you happier. As your focus rises, and energy levels recover, your mood improves. Even mild dehydration can cause irritability, but an extra glass at lunch will keep you in the right frame of mind. If you hit an afternoon slump, reach for a glass of water. Water increases your energy. When you’re hydrated, your body maintains optimum blood pressure, which helps your heart pump oxygen around your body. You feel energized, ready to tackle the day’s challenges. Standard advice recommends the 8×8 rule – that’s eight, 8oz glasses of water per day but the fact is many drinks hydrate. While nothing beats calorie-free water, there are several hacks to make sure you get your daily fill. Add a burst of flavor: If water doesn’t excite you, try adding a slice of lemon or cucumber, or even a sprig of rosemary, to your bottle. By tweaking your water with a flavor your taste buds enjoy, you’re more likely to sip throughout the day. Use an app to remind you: Even with the best of intentions, busy schedules can get in the way of hydration as you forget to take a break. Software developers have come up with the answer: smartphone apps that remind you to drink. Download, set your daily drinking goal, and let your phone give you a nudge when it’s time to take a sip. Invest in a dispenser: Unsafe drinking water is a global concern with tens of millions of Americans exposed to contaminated water each year, according to a study from Irvine University, California. Investing in a reliable water dispenser guarantees a safe supply of great-tasting water. So, people can hydrate freely without concern for their health. There are plenty of hidden hydration sources as up to 20% of your daily fluid intake comes from food. Pick the right fruit or vegetable, and you could quickly eat your way to hydration. Cucumber has the highest water content of any solid food at 96.7% by weight and is a natural addition to salads or for dipping. Celery weighs in at 95.4% water content and given its low calorie, high water, and fiber content. It’s perfect for curbing an appetite. Radishes, tomatoes, peppers, cauliflowers – there are many choices when it comes to hydrating with food. A final choice, juicy watermelon not only has an appealing fluid content, it also offers one of the best sources of lycopene: the potent anti-oxidant and anti-carcinogen that gives red foods their color. How Much Should You Really Drink to Stay Hydrated? 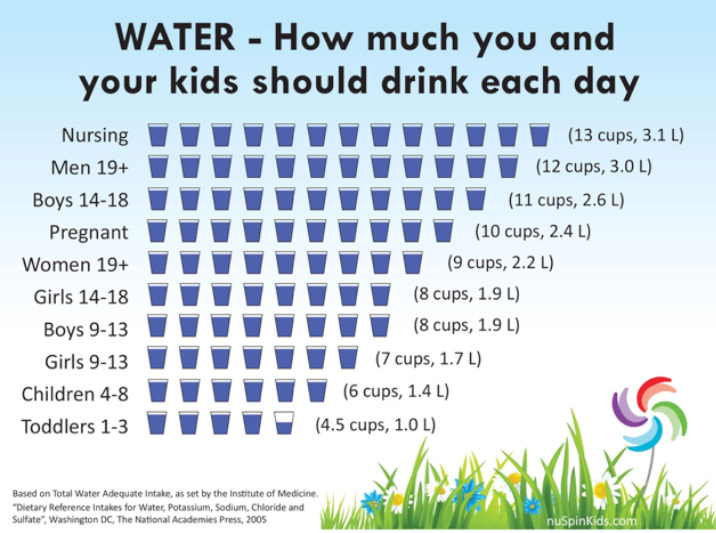 As illustrated by the graphic below, the Institute of Medicine recommends women drink at least 74 oz. of fluids a day, a little over 9 cups. While for men, this rises to 13 cups. Factors such as air temperature, weight, exercise and diet will influence how much you should drink. Provided your urine is a light color, you don’t have a headache, and you’re not feeling irritable, you’re probably drinking enough. For children, pregnant women, and the elderly, it’s best to be aware of your physical state and seek expert medical advice if at all concerned. As the leading global supplier of sustainable water dispenser solutions, Waterlogic holds hydration at its core. We promote proper hydration both in the workplace and as part of a normal routine, helping readers understand the health benefits of taking on enough fluids throughout the day. Not only does water sustain life, it helps you perform at your best, remain focused, and feel both happy and healthy. It’s not just about drinking, as plenty of foods contribute a significant proportion of your daily fluid intake. Build the right hydration habits today and set yourself up for success. how ever we reserve the duty to not support any corporate office that is contracts with technology devices that has been used against humanity all phrases are not for any cyber matrix biological theory artificial manufactured genetic DNA make believe instruments that has stolen or taken innocence out of this dimension. chance genetic biological species suppose,paradise must begin some were,called earth mysteriously technology about being sure! Suppose the health benefit’s of the fluid know as water gives the world a chance to explain to the guest’s viewers,or the audience,about how safe and clean and very important it is to rehabilitate the environment,like dam’s creeks rivers estuaries, biology genetic species were given a garden paradise to live in,think it’s called our planet earth to be sure,any way electrolosis and hydrogen with other technology science of the mysteriously.